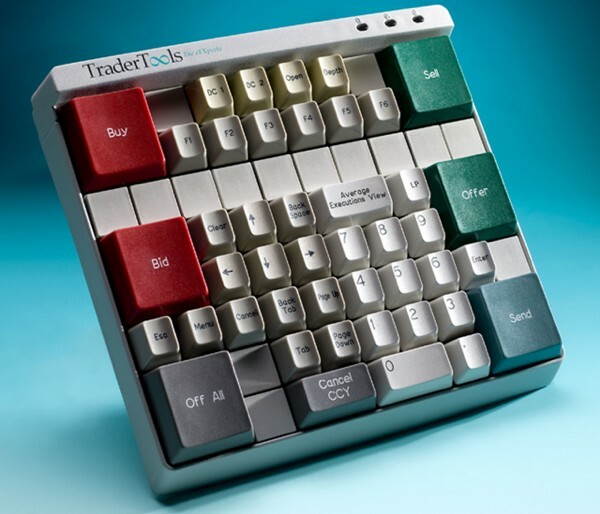 We don't usually see many gadgets aimed at the high rollers in the foreign exchange market who read this site religiously, so when we ran across this sweet piece of PR for the Al-1 Compact Keyboard for TraderTools' Liquidity Management Platform, we pounced! Sick of all those other trading keyboards that have been piling up with each new piece of software? This guy has been "humanly engineered" to replace all of 'em, with extra large, color-coded keys for the those things you do best -- like destroying the lives of average Americans. Now you can "buy low" and "sell high" with a single keystroke. This keyboard will have you aggregating liquidity with the best of them. There's no word yet on pricing or a release date, but keep your eyes open -- with the way this economy's headed, we're certain these units will be flooding eBay (and estate sales) soon enough.